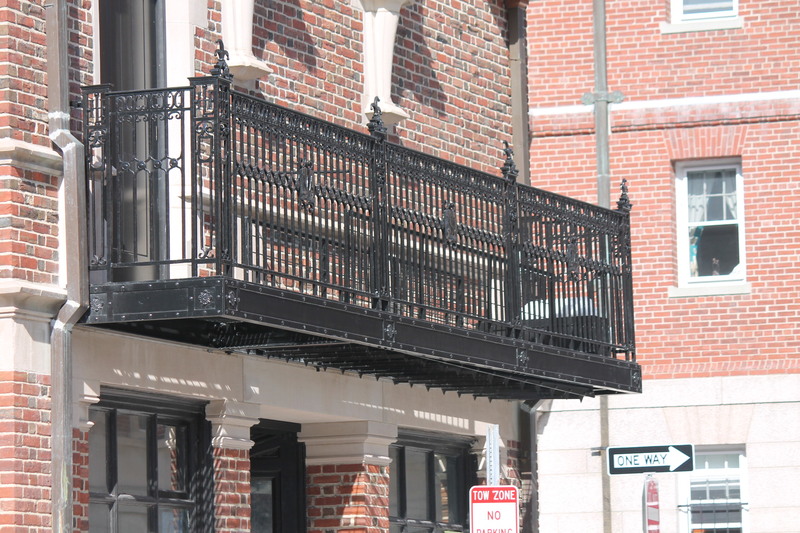 Boston’s Wrought ironwork has a very distinctive flavor . It is Decidedly English in Nature. The work produced by the working blacksmiths and Wrought iron craftsmen were from Old world stock and truly understood the design vocabulary of the designs set out by the Architects of the Boston Area. In particular they were well versed in the decorative style of the Georgian style English work with its very straight laced decorative designs and the use of rectangle stock was all hints to its origins. Another important feature was the use of Repousse foliage and Acanthus leafwork .The leaf work was of a more stout material as to be able to withstand the ravages of the Boston Weather. Decorative banding or collars were for the most part made in a more molding shape versus the flat stock type. the use of mechanical fasteners such as screws and rivets were used for all fittings of the structure of the gates or fences . Some other interesting decorative elements employed were things such as flame twist and hand forged picket points with very fancy spire or obelisk shapes as finials which were very common on the better work produced.